DO YOU WANT TO EARN AN INCOME DOING WHAT YOU LOVE? Whether you have been blogging for years or just a few weeks, Ruth’s bestselling book, How to Blog For Profit (Without Selling Your Soul), offers solid advice and practical action plans for writing amazing content that gets noticed and shared, creating compelling images, growing blog traffic, maximizing revenue, and turning your blog into a profitable business. It is an invaluable tool for experienced and novice bloggers alike, explaining not only what it takes to create an authentic, successful, and profitable blog, but how to get there as well. Better yet, it has now been updated with even more valuable information–25% more content–and this expanded 2nd edition is available in both a Kindle and Paperback version! Between the writing and the graphics, site management and design, maintaing social media presence, handling marketing, advertising, and affiliate links, the reality of creating and growing a successful blog can seem overwhelming. How is one person supposed to do it all? What should be done first? Is there a more efficient way to work? How to Blog For Profit is like having a best friend or big sister guide you through the blogging process. With wit,wisdom, and the insight of someone who has been there, Ruth shares how she grew her blog, Living Well Spending Less, to over 1 million unique visitors per month, earns a full time income, and still is able to write about the things she truly cares about. How to Blog For Profit is an essential resource for any blogger who is serious about building a platform or earning a living from their website. Don’t wait. Get it now & start implementing your new strategy today. “I’ll admit, I’m a bit of a ‘blogging for profit’ book junkie. I’ve read LOTS of them! However, most of them it’s just the same thing over and over. When I first heard about this book my first thought was ‘should I bother? There’s never anything new anymore’. I was so wrong – Ruth’s writing style is so nicely organized, and easy to read, as if you were sitting there chatting with an old friend. Her book goes into amazing-yet-easy-to-understand details on a ton of methods for making money blogging – but that’s after about half the book giving you advice and steps on actually GETTING to the point where you could make money, by growing your blog and being YOUR type of awesome. When I started this book, I honestly was considering what the heck I was doing with my blog. It wasn’t fun anymore! Ruth really helps you rethink your direction, and motivates you to find what you really enjoy doing, which will make you do that better than just ‘whatever’. She also has a great ‘Action Plan’ at the conclusion of every chapter that really help you stay organized and break things down. Her down-to-earth talk and honesty really brings her message across, and helps the reader feel that making money with your blog is completely do-able. She also points out that nobody can do everything, offers helpful organization and time management tips, including free printables, and just gives you that ‘push’ you need to take your blog to the next level. “This book is an excellent resource for bloggers, especially bloggers relatively new to blogging (i.e. have been blogging for 2 months to a year or so) and that are looking to take their blog to the next level. Ruth gives you clear advice on how to build a solid foundation for your blog, and she does an amazing job of emphasizing the importance of that foundation and it’s role in helping you make a profit down the road. For Ruth, it’s more about lasting upward momentum than getting rich quick. And I love that! Additionally, Ruth’s advice is valuable even if you are not looking to monetize your blog, since many of the same qualities that make a profitable blog are also ones that grow your readership generally. It quickly becomes apparent that Ruth is all about quality, honesty, action, and organization. I feel like I have a much clearer picture of what kinds of items need to be on my blogging to-do list, and after reading I felt empowered to actually get myself in gear and cross those items off my list. “Have you ever started a book that you just couldn’t put down? 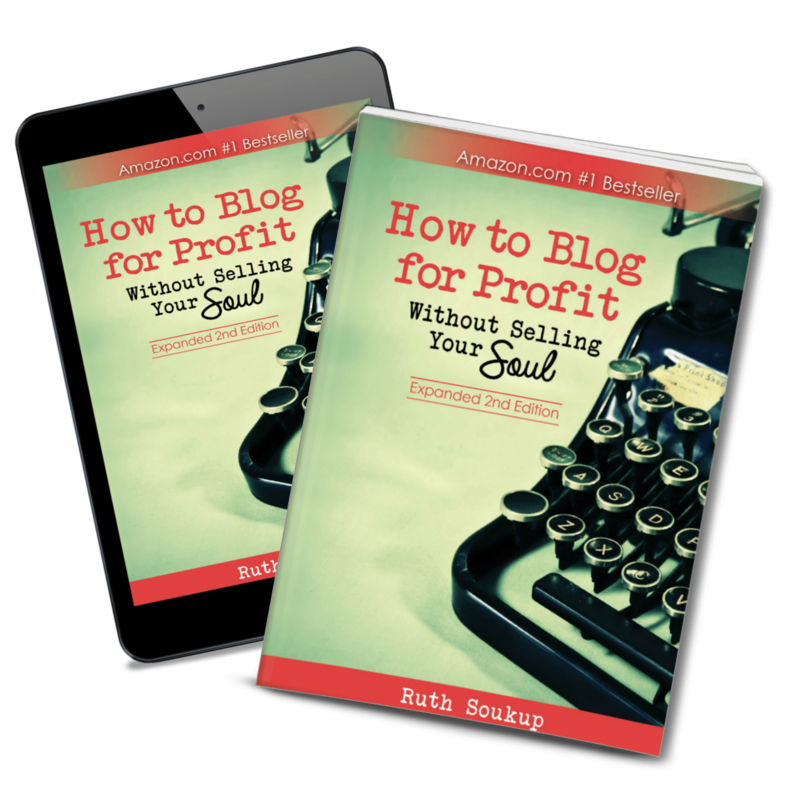 Ruth Soukup’s How to Blog for Profit is not only unforgettable, but undeniably one of the most practical and comprehensive books on blogging that is on the market! Ruth writes with contagious passion stemming from her years of wisdom in the blogging world, yet doesn’t leave young “small bloggers” like me in the dust. This book gives practical, doable steps to pursue your blogging dreams that might seem out of reach (right now), but that Ruth encourages can be made possible with dedication and hard work. The world of blogging is vast, but with concrete advice and “plan of action” steps at the end of each chapter, Ruth makes blogging (and earning an income to support your family through your blog) purposeful and possible.